Valencia. One beach villa, two (three) games, four nights, five days. Ten-to-eleven men. One, charmingly, had been in Spain with the missus for a week already. Another flew in from Berlin. A third, uncharmingly, considered himself too indispensable to his recently restored employer to miss more than a single day. (His flight, kharmically, would be delayed: fog at Gatwick.) On arrival, the team flag fluttered from the balcony, obnoxiously in the light of the Brexit vote. Sardines and croquettes on arrival. Red-ball cricket on Friday. Forty overs against Levante CC in a dried up riverbed central to Valencian town planning. Davo (Rory Davidson) arrived direct from the airport, boosting the meagre fast bowling department. A cool, Mediterranean breeze blew over the local Campo Municipal Beisbol y Softball. There were dugouts, bleachers and a metal cage, which clanged satisfying when the leather ball thudded into it. Local Spanish park dwellers looked on disinterestedly. Naturally the opposition had no trouble getting the Friday off work. Some even thanked us for the extra holiday. Others needed to pick up the kids from school later in the afternoon, so we batted first. Psychologically, every touring side likes to get off to a strong start. Cass (Ben “thanks, Cass” Cassels) was unavailable to open, or even bend over in the field it later transpired, due to a non-specific, probably not that painful, collarbone ailment. Instead, out strode Oliver “the Educator” Roberts (aka Bagman, Baggo etc) and Davo to open the batting. Davo impersonated a beefy West Indian all-rounder on an IPL boundary – swinging two bats aggressively through the “vee.” They chalked their guards. Baggo took first ball. Onlooking, we were titillated by the memory Baggo previously lofting a first ball over extra cover to the boundary. It wasn’t pretty. Baggo knocked his first ball into the on-side and stood watching it, pleased to survive. Davo, itching to get on strike and backing up aggressively, saw a single and ran. Baggo shouted “No!” loudly. Davo looked up about halfway down the pitch and realised he’d be run out if he turned back. So he pressed on. Baggo left his crease unwillingly and was run out by about 20 yards. It was appalling. Time to rebuild. Davo kept the ball out, gently hitting fielders at will. Dillon started well, moving his club average serenely out into double figures, but typically didn’t keep going, out LBW in the tenth over. 55-2. In came golden boy Ed Pearson, wisely promoted from 6 when Dean quietly shelved the “bowlers-bat-late-in-the-order-even-if-they’re-good-at-batting” policy. He inevitably tonned up. He purred. He belted drives to the cage between mid off and cover and smashed 4 sixes over midwicket. Davidson was caught for a hard earned 31. Ed was then ably supported by Hugh Pemberton, who rattled the cage for 33 legside runs and 3 surprising offside runs before being cleaned bowled. Next man in, Rudders didn’t look good for runs. He approached the crease nervously, like it was a good looking woman. First ball, he played and missed. Second, he patted it straight back to the bowler and was dropped. For the third, a slow half tracker, Rudders dropped to his front knee, hoicked across the line about three seconds too early, hit fresh air and fell over. The ball bumped slowly into his hip. LBW. A wobbly 144-4. Things were balanced. Behind the next wicket lay a flaky looking tail. Specialist ‘keeper and non-fish feaster Simon Shaw came to the crease. At first, Ed dominated the partnership, eagerly clucking Shaw into defence. But when Orville came on to bowl, magic happened. A switch flicked. Shaw decided it was time to go; he wanted runs, a score, to make a contribution. He hard swept Orville hard to the boundary. Orville stared. Shaw stared right back at him, dropped to his knee and then soft swept him fine for another four. Ed and Shaw traded singles. Shaw took another four from the final ball of that, the thirty third over. From then Shaw flourished. The partnership reached 114, a club record, before Ed retired after a magnificent, chanceless century, leaving Mark Conway to slog a quick 23 with Gimson (6*) and Shaw (60*) not out at the close. A hard but gettable total of 307. Dean shuffled the deck, bringing on Conway first change. A good decision, Conway took two wickets in his second over both caught by Baggo, moving well – if a little theatrically – to his left at midwicket (Ed – somewhat harsh, at least one of these was a ‘worldie’ by CtC standards). Conway took another in his third, reducing Levante from a comfortable looking 71-1 to 84-4. Dean sacked his other first change bowler, Ed, after two pretty innocuous overs of off spin. Birchill went for 2, 100-5, run out by Henry from backward point, with Shaw making no mistake. Jason followed for 26, face-savingly caught by Dillon in the deep off Henry’s “buy-the-skipper-a-wicket” legspin. Then, a partnership. 12 overs went for 104. Catches were dropped. (Dean close in on the drive for one, plus others now forgotten.) In the heat, bowlers toiled; toilers boiled. Baggo copped particular stick, bowling 8 straight(ish) in the heat. Dean bowled yippishly for three game-threateningly expensive overs, conceding 36. He turned to Conway, who got clobbered for 10 in the next. Suddenly, Levante were poised on 227-6 after the thirty second over, needing 80 odd off eight. The tension rose and the fielders concentrated, grimly. Nervously they waited for the opening pair to return. Then it happened. Baggo had been left on by a skipper desperate not to turn to the part timers, and arguably keen to give him game time after the early run out. After 63 solid but unspectacular balls, Baggo struck. Harris, who’d just picked up his 50, top edged. Davo (an untypically unsafe pair of hands this season) ran in from the boundary and pouched it. That was the break though. Gimson castled well-set Kiwi Dave, who top-scored for Levante with a belligerent 69. Davidson picked up Eaton, Dillon gratefully taking a loopy catch at mid off. Gimson cleaned bowled Nisar for a duck to complete Levante’s chase, 45 runs short. A friendly, competitive affair all round was topped off by a paella with the opposition, several hundred lagers and many packets of cigarettes. The evening ended in one of Valencia’s premier youth clubs. The club virginity remained intact, an impressive statistic for a no longer embryonic touring side. Saturday was a leisure day. Three played golf, and two even completed 18 holes without sulking off to the clubhouse after the sixteenth. Conway won comfortably. There was a market/tapas/coffee outing. Back at the compound, Nat manfully volunteered to be the first to go into the swimming pool in a shopping trolley, after which everybody wanted a go. It was demonstrated beyond doubt, by the Archimedes principle, that Cass (after he finally returned to the villa) had the largest head, with Dillon taking silver and Pemberton bronze. Pemberton organised the worst organised night out in club history. It began at an Italian restaurant – no reservation – and ended, some fun hours later, with the survivors refused entry to a casino on the grounds that they weren’t wearing shirts and (unvoiced) that they would have offended the clientele. The boys had been looking forward to the Sunday fixture. 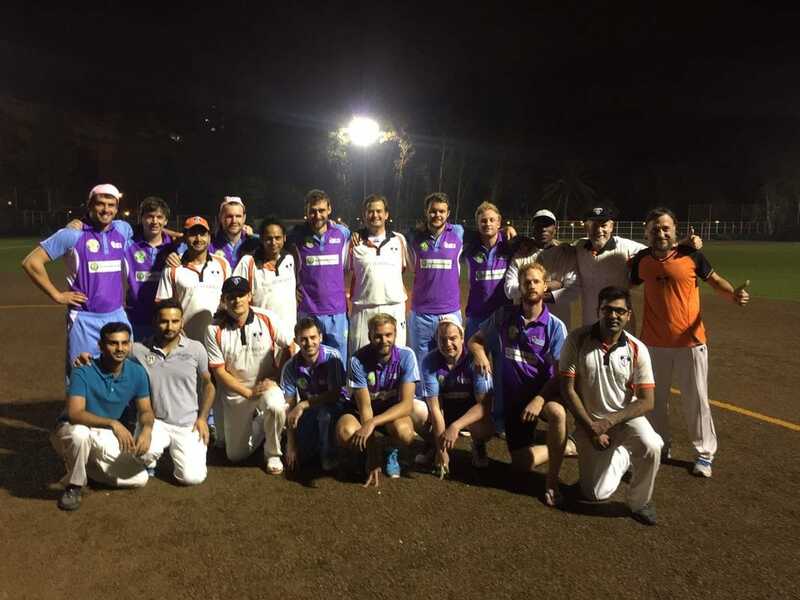 A T20 game under lights. What glamour. Confidence was high after the debut Last Man Stands season (arguably unjustified given the underperformance in the knockout stages). Levante field a changed, slightly stronger XI. We had one change, enforced by Davo’s decision not to waste any of his holiday allowance with his mates. Ringer Ali joined our ranks. Winning the toss and batting first, Levante scored well. Dean opened the bowling with a slower beamer that oppo skipper Tim crossed batted for a one bounce four. Fielders and onlookers winced. The Levante openers went well, scoring 65 (from 40 balls) and 20 (from 12) respectively. Dean picked up the first wicket, caught in the deep by Dillon, in the fifth over, which coincidentally was the most expensive of the innings. Dean’s spell: 4-0-1-41. Unfortunately that wicket brought Sandeep – Levante’s most recent signing – to the crease, who scored 80 classy looking runs (from 51). Conway shared opening bowler duties economically(ish) (4-0-0-31) and would have had a stumping, but for some cackhandedness behind the stumps. First change, Ali (4-0-1-40) trapped Sunny in front for 6 and Pearson (4-0-1-36) picked up the second opener (Tim), caught Dillon. Gimmers bowled well at the death (4-0-0-31). We struggled a little under the lights, particularly with the many high catches that were put down. Levante posted 208 – probably slightly more than we’d have liked to chase. But it was all about the chase. Dean sent out gun bat Ed and junior pro Rudders. Rudders – downbeat for most of the day – looked in the mood today, glowing under the lights and bristling during his throw downs. We started well. Ed didn’t exactly purr by his usual standards. Rudders did by his. He ran hard and hit harder, not a dishcloth in sight. The partnership went at 10 an over. Sandeep’s elegant slow left arm looked to have Rudders in trouble until he dropped to a knee and hammered a six over the cage. The tenth over went for 20. After the eleventh, we needed 98 from 9 with all wickets remaining. But Levante’s breakthrough came in the twelth. Jaggi, whose first over went for twenty, had Ed stumped for a decent 43 from 43. Rudders continued well but there were problems at the other end. Dillon came and went for 8, given out LBW by Shaw to a ball probably missing a seventh sixth leg stump. He left the pitch reluctantly, in a reaction later criticised “awful” by the skipper. The episode reflected well on no one. The 15th over saw Baggo caught for 2. 146-3. In the 16th Pemberton (who’d been in a grump all day) came out swinging and determined, taking the over for 18. 168-3. Do-able. The 17th? Gimson fell, caught off Usman, also for 2. 177-4. But Ruggers was still in. Batting imperiously and still chasing singles, running the first hard and generally being extremely enthusiastic. God how we envied him. He brought up his century to collective joy. He also cleared 200 runs for the club, no small achievement considering his two ducks on Friday made it doubtful whether he’d even make the three runs he required to pass 100. In the 18th Pemberton was run out for a worthy 16 (amusingly the third high score behind the openers). 182-5. 20.1 Two runs. Rudders hits down the ground and comes back, panting hard but back on strike. 12 from 5 now required. 20.2 One run, one wicket. Rudders pats another down the ground and tries for two. A reasonable risk that didn’t pay off. Conway is run out for 3 at the non-striker’s end by Dead Eye Jaggi trying to make it back for the second. Centurion on strike on and 11 from 4 now required. Shaw came to the non-striker’s end, full of form from Friday and with an umpiring howler to make up for. 2.3 Two runs. Rudders again. 9 from 3 now required. He needed to start rattling the cage. Pausing there, limited overs bowlers are always criticised for extras. There’s sound logic behind this; it means an extra ball has to be bowled with the chance of further runs being scored. So far, so obvious. Would conventional wisdom stand up to scrutiny? 2.4 Two wides, one wicket. Keeper fumbles (forgivably after it bounced awakwardly off the black plastic edges holding down the matting). Rudders sneaks one and tries to come back for the second. Bad call. The ball barely reached close backward square. Run out metres from the crease. Shaw remained at the non-striker’s end, still having not faced. 7 from 3. Ringer Ali came to the crease. 2.4 Wide. Another one. 6 from 3 seemed possible. 2.4 One run, one wicket. Finally a legitimate delivery. Ali swipes for one and calls Shaw through. Ali calls for the second, disastrously. Shaw run out without facing, by Jaggi yet again. Dean comes in at the quiet end. One legitimate ball had brought 4 runs and two run outs. That took us to 204-8. This was extraordinary. It was on. 5 needed from 2. 2.5 Ali castled. 204-9 – four to tie from the last. Pausing there, Law 38 (Run Out) states that a batsman is run out if he is out of his ground and his wicket is fairly put down by the action of a fielder. Sure, but what does “put down” mean? Law 28 (dramatically entitled The Wicket Is Put Down) states that the wicket is put down if a bail is completely removed from the top of the stumps by the ball. The bails were already off. Law 28 adds that that the wicket is also put down if a fielder pulls a stump out of the ground. Questions arose. If the bails are off and the stumps cannot be removed from the ground (because they’re spring-loaded nets stumps sitting on, not inserted into, the ground) then how can they be pulled from the ground? Must the fielding side solemnly pop the stumps back to where they started, replace the bails, and then knock ‘em off again? Could Cass and Dean scramble two in the time that took? Had the ball literally figuratively disappeared down a rabbit hole in the outfield? The dismissed batsmen froze. The spectators froze. The umpires froze. 10 fielders froze. One man stood alone, not paralysed into inaction. Run Out Supremo Jaggi sprang to action, legged it all the way from mid off, scooped up the ball and picked up the entire stump set, waving them madly about his head, for his third run out. * The batsmen conceded loss. It was over. A thrilling finish. 206 all out. Two short. We’d collapsed from 110-0 (surely a club record). The last 5 wickets fell in the final over for 12 runs. Beers, backslapping and bonhomie all round for the rest of the evening. *Ed – As the batsmen run out in the above I must correct Jack (as he would surely do to others). We ran one easily, I came back to the danger end for the second where foolishly the ball was being hurled into. It missed the stumps to give us the chance to go for a third… Jaggi however had backed up and now turned to throw to the keepers end to run me out… with the keeper nowhere to be seen he fired it in… had he missed we would’ve come back for the 4th to tie or possibly it would have been 4 buzzers and we would’ve won… however Jaggi hit and I was out by a foot or two… Cass and I however did come back for a 4th (just in case I wasn’t given my square leg umps) and to make sure this didn’t count Jaggi picked up the stumps and charged around.